Association Mitsinjo was formed in 1999 by residents of the village of Andasibe in east-central Madagascar. Interested to work as guides for the growing number of tourists visiting the region, our work eventually grew into much more. In 2003 we gained management of the Analamazaotra Forest Station, now known as Mitsinjo Park. 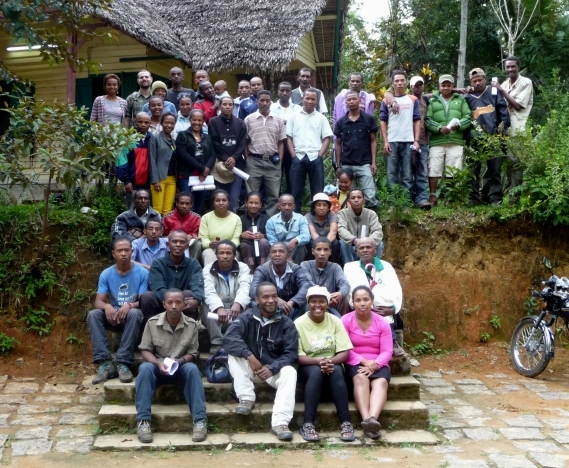 We also work in the Torotorofotsy Ramsar Site in close collaboration with Asity Madagascar. The Forest Station and Tororofotsy are now our main focal areas for conservation, research and sustainable development initiatives. The members of Association Mitsinjo, March 2013. Today our organization is composed of more than 50 members from the local community. Mitsinjo’s administrative board is composed of a President, Vice President, Treasurer and a Chef de Volet each for tourism, conservation, development and research. About half of our members are certified tourist guides for the Andasibe area, while others work on a project by project basis. In total our activities have an effect on more than 400 households in the Andasibe area. Revenue for our work comes from you, the welcomed visitor. We look forward to seeing you soon!